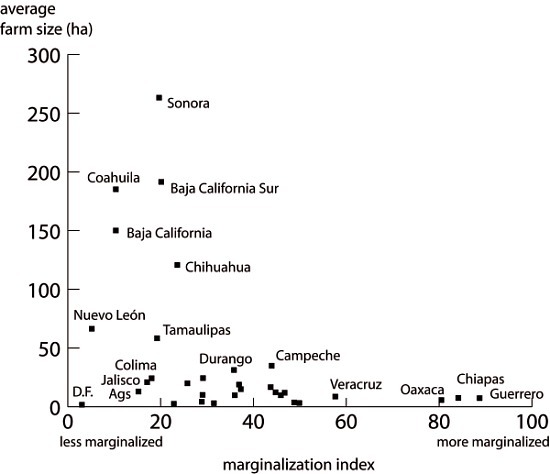 Having noted in previous posts that farm sizes in southern Mexico are smaller (on average) than in northern Mexico, and that farm size is affected by socio-economic factors, and that farmers of smallholdings are unable to generate a decent profit, it is interesting to consider the relationship between farm size and marginalization. Mexico’s National Population Commission (Conapo) has formulated a compound indicator of “marginalization” and publishes its “marginalization index” at regular intervals. Data are available at both the state and the municipal level for the entire country. This discussion relies on the state level data. Each dot on this scatter plot represents a state. For the 32 points, the statistical correlation (Spearman’s Rank Correlation Coefficient) is –0.483. This negative correlation (significant at the 95% level) means that marginalization is inversely associated with farm size (i.e. the greater the marginalization, the smaller the likely farm size). In short, the north-south divide that we found when looking at the pattern of farm sizes in Mexico is closely linked to the north-south economic divide that characterizes the country. Looking at the bottom line from DF to Guerrero marginalization could also be related to the concept of Centre and Periphery or less indigenous to more indigenous culture. And from easy access to markets to low access to markets… etc. A thought just struck me about closeness to Walmart distribution centres..